You did not gain your belly fat in a month or even in six months; it will probably not take as long to lose fat as it did to gain it but it will take time. Staying connected to a weight loss team is vital, get enough sleep, eat breakfast, and cut out unhealthy habits. Eating breakfast revs up your metabolism and is the first step in your journey to lose fat. You should try to incorporate some form of healthy protein into your first meal of the day. Spending time sleeping seems counter-intuitive to losing weight but if you are tired you do not move as much, and moving is what speeds up your metabolism. It is best to aim for seven hours of sleep every night. To lose weight and belly fat you must exercise; it is a hard cold fact. You can incorporate your exercise into your day by walking that extra 100 feet a few times a day, parking a bit further from the store, or making your dog happy with a really long walk. 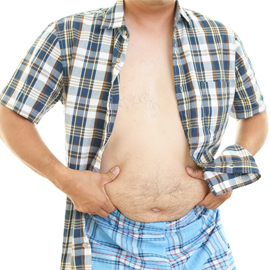 Pelvic thrusts and lifts will help tighten those flabby belly muscles as well. When you want to lose weight do not drink alcohol. Alcohol is pure empty calories and it may also cause you to eat more. Drink water as much as possible, at least sixty-four ounces a day. If you wait till you are thirsty you are already dehydrated. Try to drink a glass of water a few minutes before every meal. These are a few simple tips to lose fat. Listening to sound medical advice, eating less, moving more, sleeping more, and drinking more water will get you a long way down the road on your journey to lose weight.